Chyler Leigh as Alex, Melissa Benoist as Kara. How do you regain someone’s trust after you’ve confirmed their worst fears and assumptions? As Supergirl, Kara has stumbled in the worst way possible, succumbing to Red Kryptonite and nearly declaring herself grim goddess of National City. Of course, the rest of the world has no way of knowing whether she’ll turn bad again, so Supergirl is now distrusted rather than adored. Also in the news: J’onn J’onzz, who the world just sees as another terrifying alien. And no one is less at ease about his sudden appearance than the United States government. Now that Hank’s identity has been revealed as a sham, Colonel James Harper and Lucy Lane (!) are dispatched to the DEO to investigate an apparent alien infiltration. And that’s the problem — they’re dead set on viewing J’onn as hostile, so they don’t believe his story at all. He tells a story that we’ve heard, but never seen: Kara and Alex’s father, Jeremiah Danvers (returning guest star Dean Cain), was on a mission with the real Hank Henshaw, a ruthless man with a xenophobic streak. This Hank was ready to see aliens like J’onn — whom he calls the “Manhunter” — as a threat to be put down. Fortunately for J’onn, Jeremiah is the one who finds him first, and the two bond; Danvers tells J’onn about his girls, J’onn tells him a bit about Mars. Unfortunately, Hank’s not willing to hear Jeremiah out when he finds them. He’s solely interested in taking J’onn out. Jeremiah fights Hank to save J’onn’s life, and both are killed: Jeremiah accidentally throws Hank off a cliff, but not before Hank buries a knife into him. And so J’onn becomes Hank Henshaw, infiltrating the DEO to run it with a steadier hand. Turns out he also pulled Alex out from a low place three years ago, when she was a self-destructive party girl spending a night in the drunk tank. He tells her he gets it; her sister has exceptional powers and its impossible to feel special or worthwhile enough to put any effort into her own work. But he knows her and her father, says that his organization needs her, and she’s got just enough of a spark left in her to listen. And so, that’s how Alex joined the DEO. Nevertheless, Harper and Lucy remain entirely unsympathetic and choose to cart away J’onn (and Alex, for sticking up for him) to something called Project Cadmus. Cadmus, as Jimmy Olsen later tells Kara, is the reason Superman won’t work with the government — it’s a secret, unknown location where they dissect aliens and study them to make weapons. Concerned for what might happen, Jimmy and Kara hatch one desperate play to save Alex and Hank without the entire DEO coming after them: They’re going to tell Lucy that Kara is Supergirl. Lucy is shocked by the revelation, but also smart enough to realize it was the one thing she overlooked that explained all of her Kara-and-Jimmy frustrations. She certainly resents Kara’s lack of honesty, but she agrees to help Team Supergirl. Lucy and Kara disguise themselves as bikers to intercept the truck transporting Alex and Hank, freeing them while Hank removes the memories of the entire night from Harper — but while he also discovers something else entirely. He sees Jeremiah imprisoned in Cadmus, still alive. 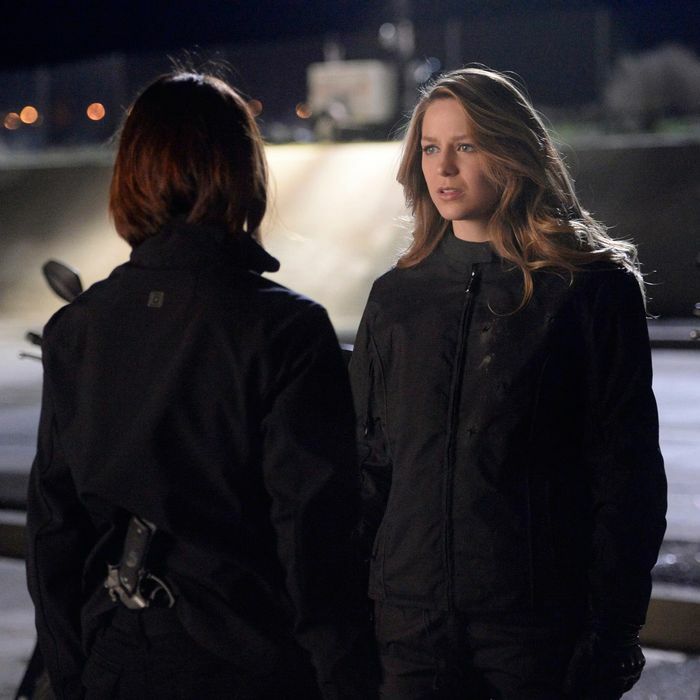 So Hank and Alex ride off together in search of Cadmus, while Lucy and Supergirl head back to the DEO, only to learn that Col. Harper left behind orders making Lucy acting director of the DEO. “You’re gonna help me do this, right?” Lucy asks, in a sweet moment that signals she’s forgiven Kara. Just then, a DEO agent alerts Supergirl about a bank robbery. Lucy: You belong out there. Kara: People don’t trust me any more. Lucy: You got me to trust you. That’s a start. As insufferable as she’s been, Lucy is absolutely right. When you screw up real bad in a way that everyone can see, when you do things you’re not proud of and you just want to hide from the world and bury yourself in self-loathing, there’s only one way to pull yourself out. You have to own your mistake, then go about making things right, one person at a time. Siobhan’s supervillain origin. Winn’s Mean Girl girlfriend finally heads down the road towards supervilliany. After complaining to Winn about how much she hates Kara, she decides to get her job back by breaking into Kara’s work computer to send Cat Grant a scathing email. Unfortunately for her, Cat employs someone who can tell who actually wrote the email. (Hi, Winn!) Humiliated and angry, she gets drunk on the roof. Mid-rant to Winn, she falls off the edge when her heel breaks — only to discover she has a supersonic scream that cushions her fall. Which will probably spell bad news for Supergirl. Finally. 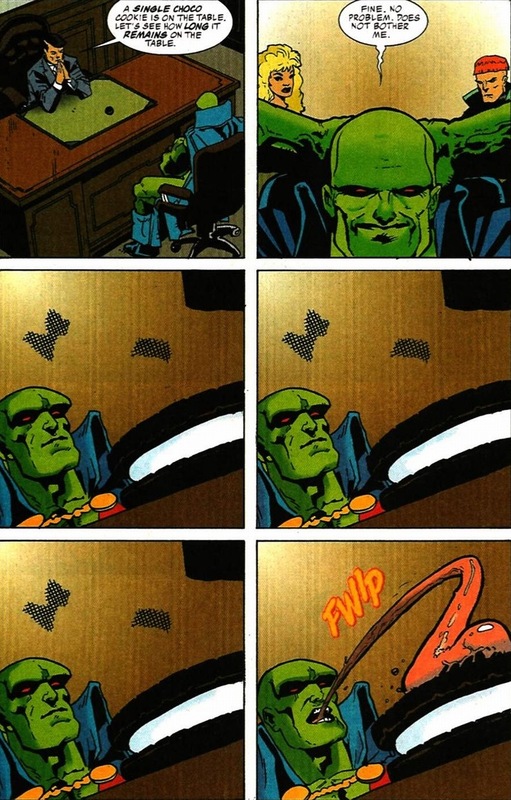 We see J’onn J’onzz eating Chocos. This is a big deal, okay? Project Cadmus, why you so shady? In DC comic books and properties related to them, Cadmus involves a whole mess of things, but it’s responsible for one big character in particular: the hybrid, teenage clone of Superman. You may know his as Superboy. WILL WE GET A SUPERBOY? I HOPE SO. Lucy Lane, back in action. Thought she was done, yeah? So did I. Glad to see she has a role that isn’t “girlfriend who exists just to complicate things for James and Kara.” I hope she works alongside Kara for a couple of episodes. Tiny Kara saves the day. A third flashback sequence, set during Kara’s early days on Earth in which she goes to school with her sister and saves a family from a car wreck mostly serves to illustrate the pure intentions Kara has for hiding her identity. It’s a nice sequence — ditto for the brief glimpse of her interview at CatCo years later. All of the flashbacks are well done, and “Manhunter” is an exceptionally well-structured episode. I am so hype for next week. THE FLASH IS COMING TO SUPERGIRL AND I MIGHT WRITE THIS WHOLE RECAP IN ALL CAPS TELL YOUR FRIENDS.